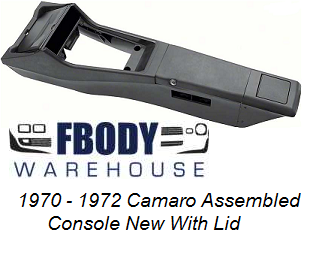 This is a brand new reproduction center console for 1970-1972 Camaro. Includes upper and lower sections, side air vents, ashtray lid, console door assembly and lock assembly. For use with cars with the Horseshoe style shifter. Shifter plates are not included, mounting kit sold separately. If you’re tired of looking at a worn out center console. Toss it and get a new one from Fbodywarehouse!